REAL VALUE. REAL COLD. : One-piece, roto-molded construction for extreme toughness and durability. LOCKaway™lid design your K2 will keep your contents ice cold or steaming hot as well as protect them from the outside elements. SMOOTHglide™covers to them which will allow the cooler to slide easily. K2’s TORRENT™ drain plug is designed for quick and easy drainage with just a partial turn, so there’s no need to fully remove the plug and risk losing it. It features a silicone gasket for a water tight seal. The Torrent drain plug is designed to fit the Summit Series coolers. Entire assembly can be removed for faster drainage. 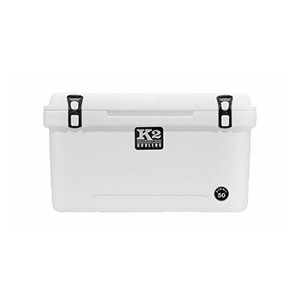 K2 has dual HOLDtight™anchoring points on both sides of the cooler for easy mounting solutions no matter the situation.Integrated padlock holes on both sides makes your K2 lockable and secure.